My name is megatron and I was referred by valentine, he told me about how awesome this website is and how everyone is alway posting great things and creative stories. My likes are just about evey form of entertainment from watching sports and listening to music to gaming and any outdoor sports.I am 21 and am from boston mass, reading is also a hobbie form time to time whenever I can find the a good one. I am currently attending college and look forward to haveing a bright future as a chiropractor. Sup Alex! Welcome to the forums, mate!! Good god my Grammer is atrocious sorry about that im not used to typeing on a touch screen. Oh my well welcome darlin'. You say Boston Mass, must be a Red Sox fan. It's a pleasure to meet you. I'm going to assume Val explained most of the good bits and if not feel free to holler at me. Well, you know my interests.... and I know yours!! Who's your favorite Decepticon other than Megatron? The only correct answer is Soundwave! Also welcome megatron, please don't enslave us. 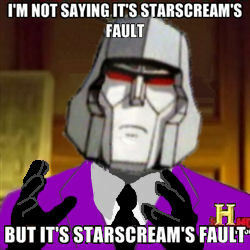 Relax, Megatron isn't here to enslave you. I believe my my favorite transformer other than megatron would be starscream his snivling antics always amuse me as for the boston red sox I saw a game at fenway in last summer vs the twins and had great seats, i haven't seen a game since however I hopefully will be seeing a Bruins game soon . I'm surprised to see another New Englander on this site my buddy lives in coventry which is close to Providence I've been trying to spend as much time out as the weather will let me and as you know it gets pretty cold around this time of year but that just means in a few months it will be time to snowboard.